In most facilities there are a variety of vehicles or moving machines that can be quite a hazard to people in the area. When employees are walking through the facility they need to be extremely careful to avoid getting hurt. Sadly, hundreds of people are injured or killed each year because of in-facility accidents with vehicles. One effective way to minimize this risk is to clearly identify areas where people can walk with reduced risk. Identifying places where vehicles don't drive and machines don't operate will allow people to walk in much greater safety. 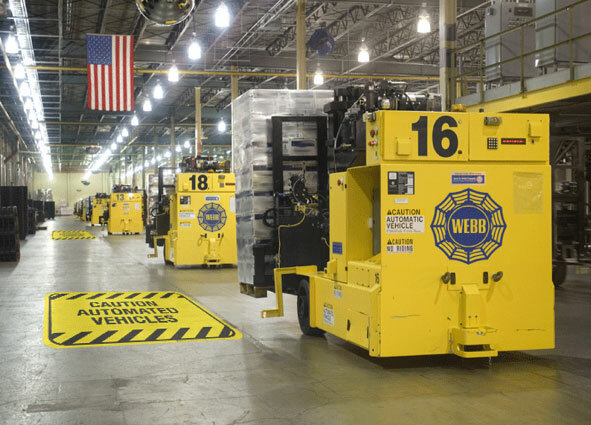 Placing floor safety stickers in these areas will encourage employees and others to use these paths whenever possible so that they are protected from danger. There are many places in facilities that can become quite slippery. Areas near entrances or exits are often wet during the winter or anytime it rains. When wet the floors can be extremely dangerous. There are special floor safety stickers that can help to add traction to any floor, even when it is wet. What's even better is that you can have floor safety stickers that add traction and also say something like, "Floor Slippery when Wet." This will convey a clear message while also improving safety. Of course, other areas in a facility can also become slippery so use these types of stickers anywhere that a slip may occur. Falls from heights are one of the biggest risks in many warehouses, manufacturing facilities and construction sites. When people are carrying items or otherwise have their vision obstructed from seeing ahead of them, they can easily fall right off a ledge and get injured. Placing specific shaped or colored stickers on the floor leading up to the ledge will provide another way for people to know that the ledge is nearby. People can often see the floor in these cases, so seeing the stickers will let them know that they need to take extra care. 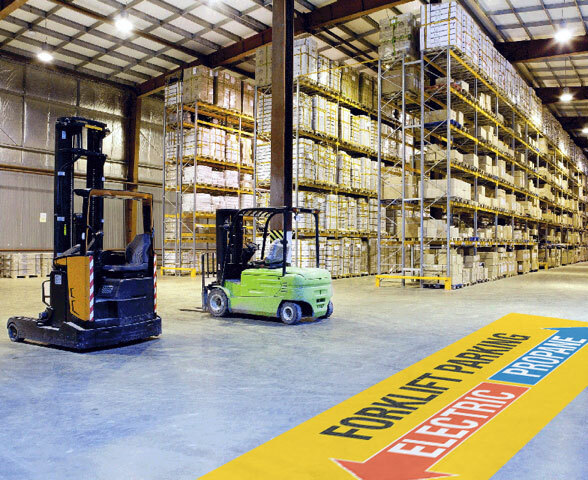 While most people think of floor safety stickers only going on the floor of a facility, they can also be put on platforms in construction sites. This type of use is a great way to always keep the ledges in people's minds so they are less likely to experience a fall. When people think of stop signs they often assume that it has to be a vertical sign, but that is not the case. There are many situations in facilities where it is best to use a floor sticker to let people know that they need to stop. This is most commonly going to alert drivers of high-lows that they need to stop at an intersection or other area, but can also be used to let pedestrians in the area know that they need to stop. However you decide to use it, placing a large sticker on the floor that say stop will quickly tell people that they need to halt where they are and take note of the area around them. If everything is clear, they can continue on. If not, they need to stay there until it is safe to proceed. Floor safety stickers can come in many shapes and designs. One option that many people don't think about is a simple 'corner' sticker. This sticker can come in many sizes and simply forms a corner shape. Facilities can place them around the edges of a four way stop to make it 100% clear that drivers or pedestrians are approaching an area where other traffic may be present. It is often these very simple forms of visual communication that let people know that at potential hazard is in the area. A corner sticker may seem like nothing at all, but in reality it can be lifesaving. Darkness can make a normal area of a facility into an area that is very dangerous. Whether an area is dark because it is after hours or because it is outdoors at night, doing all you can to make sure people are safe is very important. 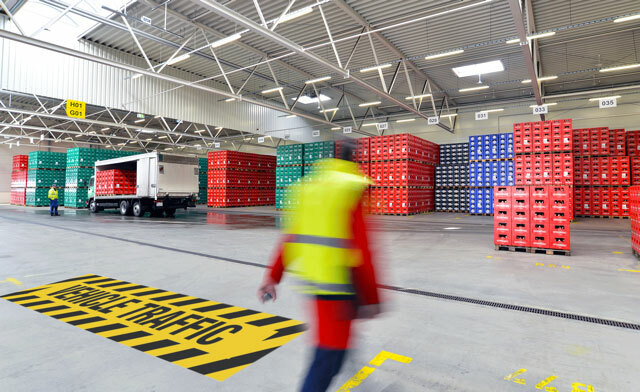 Adding reflective floor safety stickers to the floor or ground in the area can help ensure everyone driving through can see exactly where they are going. Using these types of stickers along a driving lane or aisle, for example, makes it far safer for everyone involved. When entering an area where personal protection equipment is required it is a good idea to have as many reminders as possible. You can have floor safety stickers printed that have a respiratory mask on them, for example, to remind people that they must wear one of these devices to stay safe. You can even put another sticker in front of the area where this type of personal protection equipment is kept to make it easier for everyone to get what they need. Similar to the PPE stickers, it can be very helpful to put floor safety stickers near all types of emergency equipment. This should include fire extinguishers, emergency defibrillators, emergency eye wash stations, emergency shower stations and more. Having these stickers in place will help make it clear where the emergency response equipment is, which is essential in a high stress emergency. These stickers can also make it easier for emergency responders such as fire fighters to know what is in the area. Letting people know that driving traffic could be in an area is extremely important. If you have indoor vehicles traveling in any part of your facility it is extremely important to ensure you have a floor safety sticker in place to alert pedestrians and others of the risk. There are plenty of options on how this can be done. Some facilities like to use large stickers that go in the actual area where the vehicles will be driving. Others choose smaller stickers that can line the aisles where the vehicles may be. Whatever you choose, it is very important to ensure you have stickers in place to alert people to the danger. Many people don't realize that it is possible to have custom made floor safety stickers made for your facility. If you need to convey instructions to people in an area, these stickers are often the perfect solution. One great example of this would be having a large floor safety sticker placed near an intersection in a facility which reads, "STOP: Sound Horn - Then Proceed." This will let the drivers of any vehicles know exactly what they need to do in order to keep themselves and everyone else in the area safe. You can customize these stickers to convey the exact message you need. You can even have pictograms added for further clarity. 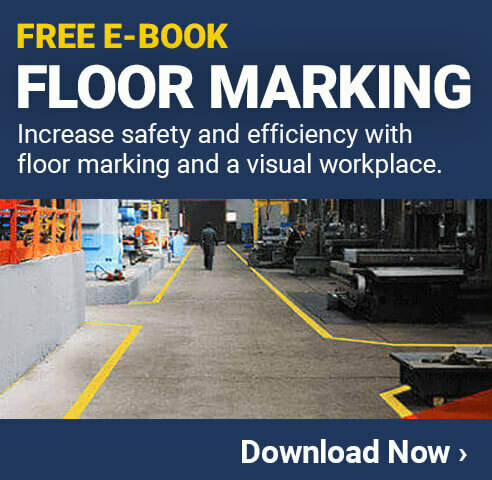 To get this done you can order the floor safety stickers you need here or you can use a LabelTac printer to make smaller custom stickers yourself in your own facility. This is a great option for any company that tends to need to have lots of stickers within the facility. 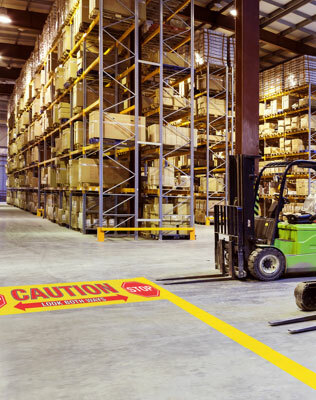 As you can see, there are many ways that floor safety stickers can help to improve the overall safety of your facility. If you haven't already, make sure you either order your safety floor stickers or else a good LabelTac printer to print them yourselves. As you can likely imagine, these stickers can literally save lives so you don't want to put it off another day. Proper Installation - Make sure all safety stickers are applied to a clean, dry surface. The sticker should then be stepped on or otherwise pressed down to ensure it is secured to the floor. Proper Cleaning - Stickers can be cleaned just like the floor around them. Sweeping them on a regular basis and then mopping over them is typically all that is needed. The big thing to keep in mind is that a sticker is useless if it becomes unreadable due to dirt, grease or other things. Make sure to clean the stickers regularly. Avoid Scraping - While these stickers can certainly stand up to most typical activity in the facility, it is best to avoid having things scrape over the edge of the sticker.